The Museum of the ancient Agora (Stoa of Attalos) is housed in the Stoa of Attalos, a reconstructed building of around 150 B.C. (it was fully reconstructed between 1952 and 1956). It was built by and named after King Attalos II of Pergamon who ruled between 159 BC and 138 BC. The Stoa of Attalos is recognised as one of the most impressive stoæ in the Athenian Agora. The characteristic feature of the museum is that the exhibits are all closely connected with the Athenian Democracy, as the Agora was the focus of the city's public life. The Stoa of Attalos was discovered during the excavations carried out by the Greek Archaeological Society between 1859 and 1902. 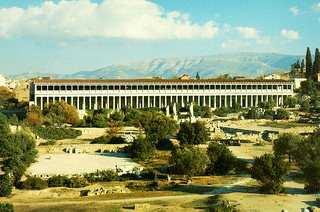 In 1953-56 it was reconstructed in order to house the finds from the excavations at the Agora. In 1957 the Greek state assumed responsibility for the administration and security of the museum and the archaeological site.